1 A None No Power Seat 1 A is a standard Premium Rouge Bulkhead seat. The tray table is in the armrest, making the armrest immovable and slightly reducing seat width. There may be no floor storage during take-off and landing. 1 C None No Power Seat 1 C is a standard Premium Rouge Bulkhead seat. The tray table is in the armrest, making the armrest immovable and slightly reducing seat width. There may be no floor storage during take-off and landing. 1 D None No Power Seat 1 D is a standard Premium Rouge Bulkhead seat. The tray table is in the armrest, making the armrest immovable and slightly reducing seat width. There may be no floor storage during take-off and landing. 1 F None No Power Seat 1 F is a standard Premium Rouge Bulkhead seat. The tray table is in the armrest, making the armrest immovable and slightly reducing seat width. There may be no floor storage during take-off and landing. 12 A None No Power Seat 12 A is a standard Economy Class Rouge Plus bulkhead seat however, the bulkhead at this seat is a curtained divider that may be annoying to some passengers. 12 B None No Power Seat 12 B is a standard Economy Class Rouge Plus bulkhead seat however, the bulkhead at this seat is a curtained divider that may be annoying to some passengers. 12 C None No Power Seat 12 C is a standard Economy Class Rouge Plus bulkhead seat however, the bulkhead at this seat is a curtained divider that may be annoying to some passengers. 12 D None No Power Seat 12 D is a standard Economy Class Rouge Plus bulkhead seat however, the bulkhead at this seat is a curtained divider that may be annoying to some passengers. 12 E None No Power Seat 12 E is a standard Economy Class Rouge Plus bulkhead seat however, the bulkhead at this seat is a curtained divider that may be annoying to some passengers. 12 F None No Power Seat 12 F is a standard Economy Class Rouge Plus bulkhead seat however, the bulkhead at this seat is a curtained divider that may be annoying to some passengers. 17 A None No Power Seat 17 A is an Economy Class seat that may have limited recline due to the exit row behind. 17 B None No Power Seat 17 B is an Economy Class seat that may have limited recline due to the exit row behind. 17 C None No Power Seat 17 C is an Economy Class seat that may have limited recline due to the exit row behind. 17 D None No Power Seat 17 D is an Economy Class seat that may have limited recline due to the exit row behind. 17 E None No Power Seat 17 E is an Economy Class seat that may have limited recline due to the exit row behind. 17 F None No Power Seat 17 F is an Economy Class seat that may have limited recline due to the exit row behind. 18 B None No Power Seat 18 B is an Economy Class Exit Row seat that has extra legroom and extra space on the side due to the missing seat. There is no floor storage during take-off or landing. 18 C None No Power Seat 18 C is an Economy Class Exit Row seat that has extra legroom. There is no floor storage during take-off or landing. 18 D None No Power Seat 18 D is an Economy Class Exit Row seat that has extra legroom. There is no floor storage during take-off or landing. 18 E None No Power Seat 18 E is an Economy Class Exit Row seat that has extra legroom and extra space on the side due to the missing seat. There is no floor storage during take-off or landing. 19 A None No Power Seat 19 A is a standard Economy Class Rouge Plus seat that has extra legroom due to the missing seat in front. 19 F None No Power Seat 19 F is a standard Economy Class Rouge Plus seat that has extra legroom due to the missing seat in front. 31 C None No Power Seat 31 C is a standard Economy Class seat however, the proximity to the lavatories may be bothersome. 31 D None No Power Seat 31 D is a standard Economy Class seat however, the proximity to the lavatories may be bothersome. 32 A None No Power Seat 32 A is an Economy Class seat in the last row of the aircraft. This seat may have limited recline and the close proximity to the lavatories and galley may be bothersome. 32 B None No Power Seat 32 B is an Economy Class seat in the last row of the aircraft. This seat may have limited recline and the close proximity to the lavatories and galley may be bothersome. 32 C None No Power Seat 32 C is an Economy Class seat in the last row of the aircraft. This seat may have limited recline and the close proximity to the lavatories and galley may be bothersome. 32 D None No Power Seat 32 D is an Economy Class seat in the last row of the aircraft. This seat may have limited recline and the close proximity to the lavatories and galley may be bothersome. 32 E None No Power Seat 32 E is an Economy Class seat in the last row of the aircraft. This seat may have limited recline and the close proximity to the lavatories and galley may be bothersome. 32 F None No Power Seat 32 F is an Economy Class seat in the last row of the aircraft. This seat may have limited recline and the close proximity to the lavatories and galley may be bothersome. Air Canada Rouge provides wireless streaming of movies, TV shows, and music to passenger's portable electronic device. Passengers must download the Air Canada App to their iOS device (Androids coming soon) in order to access the content. This service is available available for a fee in Economy and is complementary in Premium Rouge. All Premium Rouge passengers have access to an AC power port at each seat. On flights to the Caribbean, complimentary non-alcoholic beverages will be offered to all passengers as well as a delicious for purchase menu featuring hot and cold meals and snacks as well as alcoholic beverages. Air Canada rouge is the new leisure airline from Air Canada. This aircraft is used on routes to Cuba, Costa Rica, Jamaica and the Dominican Republic. This A319 features next generation wireless streaming of entertainment content to passenger laptops, tablets or smartphones. This version is configured with Premium Rouge in Rows 1-3. Premium Rouge is Air Canada Rouge's Short Haul Business Class product. Like most said already, there's not much leg room on these seats if your taller than 6'1 (the exception being bulk head seats in row 12 & Premium. It's especially tighter if the person in front of you has their seat all the way back. Also, it's a small complaint but having NO power outlets blows my mind. It's 2019, how the heck is this possible. Most uncomfortable seat ever. I am 6'1" and my knees were crammed against the back of the seat in front. When the seat in front was reclined, the seat was 5-6 inches from my face. This makes it more difficult to read a magazine or use tablet or laptop device. There is no video device installed or usb connections. The seat cushion itself felt like sitting on a board (very uncomfortable). I won't ever be flying Air Canada again. This is the worst seating I have ever seen, I really felt like a sardine in it's can. Zero confort, I'll make sure that I do not fly again in an Air Canada A319 (rouge), I prefer a Dash-8 plane. The extra leg room for this row is very marginal, if any. Overall, for an average-sized person, it wasn't bad for my 3-hour flight, but I would definitely avoid this plane on a trans-Atlantic flight. This Rouge Plus seat has a bit of extra legroom over the rest of the seats in this sardine can also known as a Rouge A319. The seat itself is uncomfortable and narrow. This is the most awful airline experience I have ever had. I usually try to avoid Rouge at all costs but we were on a cruise and needed direct flights. My advice though is if possible, fly another airline! All of the window seats in rows 2 and 3 in Premium Rouge are bad. The space between the center console and the seat in front is about 12 -14 inches. If the seat in front is reclined it is impossible for the passenger to get out. Pretty nice seat. You can choose this seat with no charge 24h before taking off at check in. While I agree that seats are very tight, to my surprise the flight was bearable. Being 6'3'' I was expecting hell, but even though my knees touched the front seat, it was relatively ok. I survived a 5 hours flight without pain and got out in good condition. Still, I would absolutely prefer regular AC seat for obvious reasons. No space for legs. Difficulty contorting myself to get feet under seat ahead. Knees always in contact. Hot, cramped, uncomfortable. Very poor value. Absolutely horrible. The seat was completely worn out and had a bit of padding only on the edges. The middle of tbe seat felt like bare wood. I couldnt get comfortable no mater how i shifted. Unhappily, it caused my chronic coccyitis to reactivate. I could hardly move at tbe end of the 3 1/2 hour flight back from holguin, cuba. This was by far the wirst flying experience of my life. I knew we would be squished in, however i didnt expect it to be like sardines. I would never fly air canada rouge again. It was like a flying school bus. Im 68+ years old and this was just too uncomfortable for me. I am not a big person, so size was not the issue...the horribly worn out, uncomfortable seat was. Awful awful legroom. I'm 6'-1" and a little bit of a bigger guy, and thought that sitting in an aisle would help for me to stretch out. This seat is absolutely unacceptable in terms of legroom. Never going to fly Rouge again. Save your knees and fly WestJet instead if you can. Yes, this seat has extra leg room due to missing seat in front of it but BIG disadvantage is terrible noise and vibration coming from the engine located on adjacent wing. I had to move couple rows to the front and this nuisance went away. This seat should be marked green/yellow (mixed review seat). My seat 2'nd row was comfortable and spacious. The crew was top notch- warm, friendly and extremely professional. We were served a lovely hot meal with wine and enjoyed a great flight between Toronto and Fort Myers. After reading the reviews i was terrified to board my flight as i am 5'9" with long legs comparable to a 6' man. I was pleasantly surprised upon sitting to find that i was comfortable. My knees touched the seat in front, but it was soft and padded and felt cocoon like but comfortable. I had room for a small sherpa lumbar backroll as i had thrown out my back a few days prior. Flt was 2 3/4 hrs and i was very comfortable. I even had my dog in her kennel under the seat in front of me. I brought my own lunch, but purchased wine in short time. Crew was top notch! For the record, i have never been comfortable on westjet, and the space under the seats for pet kennels is at least 2" shorter! I'm staying with rouge. While this looks like an exit row and I was told by agent it was there is very little legroom for taller people!! Long annoying flight. This seat, along with 19F on the other side, is easily the best seat on the plane. With a missing seat in front of you, you have unlimited leg room. 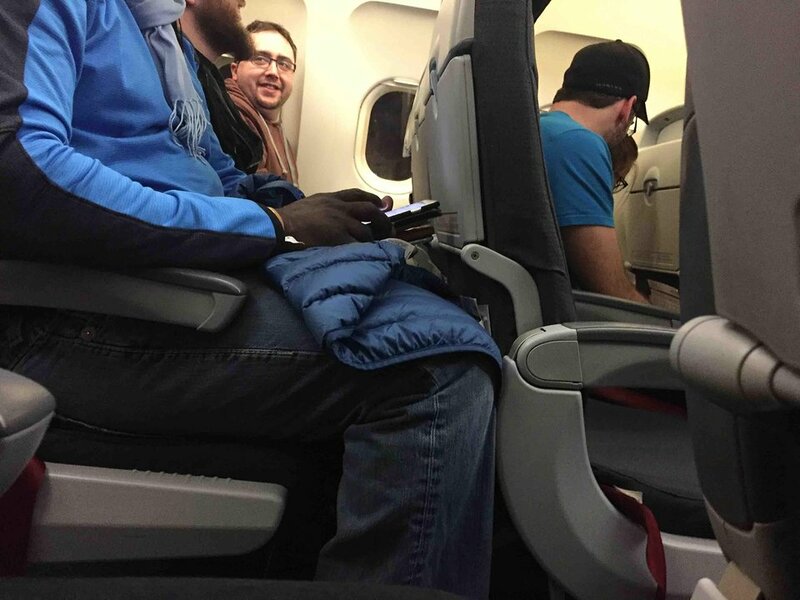 Tray table is in the armrest, and you don't have a seat in front of you to store bags for takeoff and landing. But the extra space more than makes up for it. The only drawback is that you'll likely get jealous death stares from the people around you. This seat is extremely small for anyone who is 5'11" or taller or has long legs. It's very cramped. See if you can upgrade. 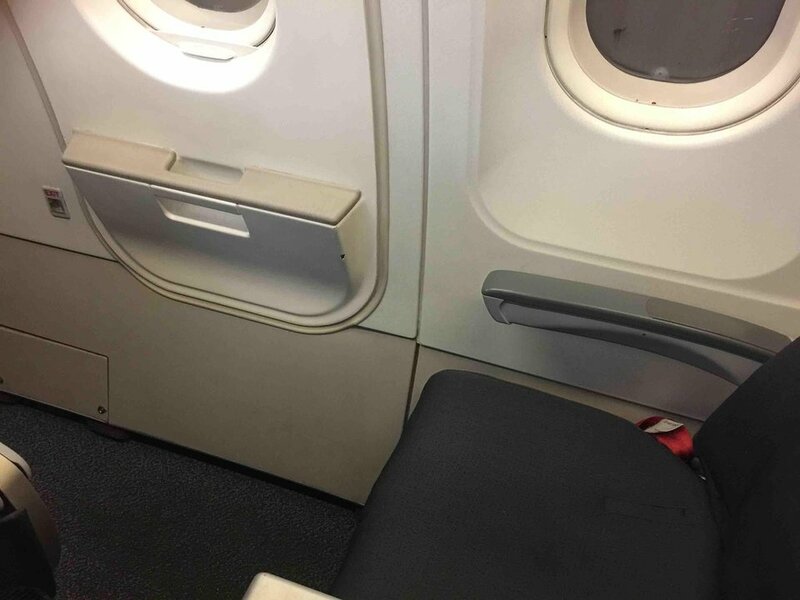 On the return flight, I bought an exit row seat (19F) for $45 CAD and was much more comfortable! I am 6'4" tall and this seat was a horrible experience! If I was warned ahead of time I would have paid for premium economy and been sad I had to pay for comfort but this seat was a very painful experience for me with my legs pressed into the seat in front of me. Luckily nice passengers made some moves around the plane to open the seat next to me so I could spread my legs more. Never again! Absolutely disgusting. I fly short haul frequently, typically avoiding Air Canada at all costs. First time on a Rouge flight, so I wasn't aware there was a class lower than Economy. If you are over 5'10" good luck feeling your legs after 5 hours. Rouge for a 5 hour flight??? Not a good seat outside of Business and if you are at the back, good luck getting a hot meal. Your left leg will hit the metal support for the business class seat in front of you. Not much room for your feet in front of you. I would not recommend this seat. Flew SAN-YYZ on Air Canada Rouge. I thought the seating was tight, but I was fine on the flight. I'm 5'9" and sitting straight up in the seat, my knees did not touch the setback in front of me, but they were very close to it. I would NOT book a regular economy seat if I were 5'10" or taller. Instead you should pay for a premium seat or Premium Rouge unless you're willing to be extremely uncomfortable for hours on end. I chose my seat assignment for free at the 24 hour mark before departure rather than pay extra to choose it sooner. However, be aware that the charge for premium seats and Premium Rouge does NOT disappear at the 24 hour mark, so if you want/need the extra space, book the seat when you make your reservation. The price never went down for those seats. For this exit row seat there IS floor storage. There i maybe 1 inch of extra legroom but that's it. There are movable armrests for this row. Legroom was decent because the seats are really thin. The seats recline very little so the person in front of you will not intrude much. The pitch was too tight for me so I payed 45$ extra for seat 19a on my way back. It was worth my money on a 4.5 hour flight back from Cozumel. Some of the comments are somewhat over exaggerated. Im 5'11" and my knees were hardly "digging" into the seat in front of me and tray worked fine even with seat reclined. It was a short flight from Vancouver to Las Vegas (2hrs 45mins),but non the less a pleasant flight with pleasant crew. I find it funny that people expect 1st class benefits when flying economy. Come on people buck up and dont be so cheap if you want the 1st class experience. Seat pitch is only 29 inches. Are you kidding me? This is Air Canada Rouge. Should be Air Canada Useless. Give people a break, this is way too tight. The seat pitch is so tight that only short women can fly this airline. That may be good if you are single as you will be rubbing legs with the ladies. I hated my flight. The aisle is so narrow that the cart can barely get by--god forbid you have a foot out. This airline should be taken out and shot!! School buses have better seats. The comfort level on this flight was sub-standard. Seat 15-D like 95% of the other seats, was cramped to say the least. Knees pressed against the back of the seat in front of you, even if youre 5-7. If the person in front of you recline their seat, you have to spread your legs. Actually just your left leg, which is already out in the aisle, and will certainly be hit by the peanut cart. The other one is pressed up against the reclined middle seat or the person next to you. Who knows where the middle and window seat people put their legs ? The tray table barely supports an electronic notebook. Forget it if the seat in front of you is reclined. Did anyone mention that aircraft C-FYJE is 20 years old. It may look good on the outside but its tired and worn on the inside. Long overdue for retirement. The aircraft was packed on this flight from FLL to YUL and the price was not cheap either, despite having bought the tickets 2 months prior to flight. (Paid extra for seat and checked baggage). Check in staff at FLL was very friendly and professional. This aircraft is awful re seat room. Row 18 should NOT be green since there is a rear-facing crew seat on the extreme left making it an even tighter fit - and no window! The curved fuselage wall in the window seats makes tall people have to lean inwards! And no seat back screen.We had booked on United but it turned out to AC Rouge! As far as legroom is concerned one of the worst flights I have taken so far. I am about six foot one and my knees were dug right into the seat in front of me. I ached terribly getting off the aircraft. I fly mainline AC frequently and have always had positive experiences so Rouge was a major disappointment. Only plus is the flight attendants are young and far more kind and motivated then mainline AC. Very short and uncomfortable seat cushion. Little protection from the knees of passengers behind you. Totally agree with the other comments; just not a pleasant experience. I was on a 3-1/2 hour flight from Montreal to Tampa. I was excited at first because hey; nonstop flight from YUL to TPA gets me home quicker than the usual stop in ATL. After a couple hours in this zero-legroom torture device, I was desperately wishing I did have a layover somewhere. I'm 5'7" and MY knees were pressed into the back of the seat in front of me. That is just madness. I am 6'2". I was packed in so tight that I was pressing the "seat back", back. On take off the flight attendant thought that my seat was reclined. I had back pain for a week afterwards and I'm not prone to back pain. Never again.This airline is only for short people. Based on all the SG reviews of the Rouge economy section, we ponied up extra bucks for the Premium Rouge (searched as Business Class on the AirCan Vacations site) and were very pleased. (aircraft was the A319-100, Reg# C-GBIN, Fin# 284) Much better than most Euro biz class seats. Being in the last row on the outbound, felt that as a courtesy we would not recline back for knowing that row 12 already was squeezed tight. Not a concern on the inbound, being 1 row ahead now. Also the gap between the seats (below the curtain) made us temper remarks about our "gushing" approval of our seats, so not to annoy the sardines behind us. As AC retro-fitted the original 3 seat J class configuration to 2 seats only, you still get 3 air vents and lights. Rows 2 & 3 give you two accessible windows, possibly Row 1 may only be one. Tray tables (in the armrest) were a generous size due to seat width, enough space for dinner tray and the provided iPad (or your tablet) to eat and view at the same time. No obstructed space under the seats for either feet or carry on. Nice fold down foot-rests. Only minor negative is that the centre armrest, while quite wide, extends out enough to make getting to/from window seat a tad acrobatic. And the power ports on the front are hard to see for connection. Another small tray pops out from the front as well, but not really useful. All in all, top marks for the first 3 rows and strongly recommended if you can afford it. Also gives you lots of other biz class benefits. Air Canada Rouge is AWFUL, There is no room for our carry on luggage, knowing this we checked our bags, guess what they did not arrive at our final destination!We paid the extra for more leg room, as we have flown rouge economy and it is absolutely awful! I was in the middle seat which did not have a seat in front of me, but that meant know storage pocket in front of me and dinner tray for all three of us were in the armrest. I love Air Canada BUT will fly with anyone else if I have to fly Rouge with Air Canada again! My first time on a Rouge plane. I am 6'1" tall and this is the first time I have flown with my knees pressed against the seat in front. 29" seat pitch is unacceptable making the flight very uncomfortable. I think the airline should be called Crimson, for all the blood on the seatbacks from the crushes knees! Positive aspects: decor is new, Flight Attendants are friendly. I will avoid flying on a Rouge aircraft in the future. Far and away the most uncomfortable experience I have ever had on a plane. I'm six feet tall, the 29 inch pitch was pure torture. I would not fly Rouge again under any circumstances - not even at gunpoint! Truly horrible in every way. 18B is supposed to be an exit row. What a joke! There is no difference between this row and any other cramped row on this disgrace of an airplane. I will never fly AC Rouge again. First time flyer on Rouge from SFO to YVR. 2 inches less leg room compared to other A319's. Thank god the person in front of me didn't recline his seat. Most uncomfortable 2 hour flight I have had. Happy to get off the plane. Will fly UA to SFO next time. Same type of aircraft, but 2 inches more leg room and at the same price. Avoid Rouge if possible. Are you listening Air Canada. There are terrible seats, not worth the extra fee. First, these are not bulkhead. You have two business class seats in front so you end up with 3 people sharing two seat back storage spaces. Second, the two seat configuration means that the aisle seat has really bad leg room. Third, there is a tiny curtain they pull across after take off to separate from business class cabin (curtain is annoying). Forth, because of the two seat config in front, there are no fold down tray tables. This means they are in the armrest, which makes armrest unmovable. I have never been more uncomfortable on an aircraft before. I'm only 5'10" & my knees were jammed against the seat in front of me. Thank God that seat wasn't reclined. I experienced severe knee pain during the entire 2-1/2 hour flight between Tononto & Tampa. Beware when booking seats on this aircraft. The seat pitch is incredible small. 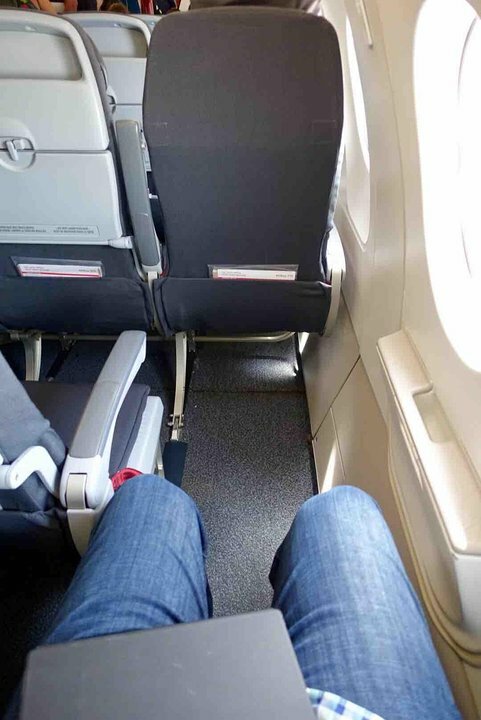 I am 6'2 and found my knees being pushed into the seat in front of me. Needless to saw I was very uncomfortable during the entire flight. This also made it extremely difficult for all passengers to move from the window seat to the aisle. Entertainment system is very limited and only streams to apple devices. No luck if you have an android device. The service was OK - about what you expect from an economy airline. I am NEVER going to fly ROUGE again. Be careful when booking your flight on the Air Canada site - it does not always indicate if you are flying true Air Canada or Rouge. I'm 5'10" and the seats were very tight. My knees were right up against the seat in front of me. I'm very thankful that the passenger in front of me did not recline their seat or it would have been inches from my face. Other than that, it was a great flight. Tight. 29" pitch is no go for a 6 footer. I now know to avoid Air Canada's Rogue discount airline when ever possible. However the direct flight from Phx to Toronto is great. Absolutely 100 percent horrible. I flew from LAX to VAN and back to LAX and it was horrible. The seats are so incredibly small they might as well just have you stand up. And the Flight Attendants were rude and unprofessional. I flew on Air Canada Rouge on August 1 2015 on a 755 am flight and the only male stewardess on the plane stunk like BO and would constantly bump in to you as he passed by with the trolly. And when we landed in Canada I heard a thud and that was him being thrown around the cabin because he was standing in the back galley after the pilot told all flight crew to be seated. The other stewardess was just laughing at him. On the way back the seats were just as small and there was some loud annoying lady in front of us telling the guy next to her how she had been quarantined on a cruise she just got off of and how the she told the crew on the ship she took the medicine they gave her but she really did not take it. Being stuck 37,000 feet in the air with your legs crammed in the seat in front of you, flight crew that smells horrible and constant hazards like a ill woman and a flight attendant being thrown around is not worth the money and Air Canada should be paying you to fly with them. I know I will personally not be flying with them again and I would strongly recommend booking on a different airline. I am 6 feet tall. My knees hit the seat in front of me. 29" pitch is to tight. 31" is good. Grin and bear it or avoid Rouge if you can. Frequent flyer - SE. Did not use AVC to go to Cancun because of Rouge. Horrible. Do not use. Used Rouge for Vegas and Houston, DO NOT DO THIS YOURSELVES. Stay away and go United for the Rouge segments. I agree with all of the negative comments I have read so far. 1) I am an extremely frequent flier (about 70 segments a year); 2) My flight from YUL to LAS was in fact the most cramped, uncomfortable, dirty, unpleasant flight I have ever taken in my life - and I have flown in latin america. 3) I paid *business class* fare to have the *worst* flight experience I ever had in my life!!!! That's right; for a business class fare I was provided a broken down 3+3 seat that was actually painful to sit in because the padding was gone, and I was seated on the cross members of the seat. My wife's seat was the same. The business class fare seemed to be justified by the fact that the middle seat was empty. However since we had made the mistake of choosing the front row, we could not even lift the armrests to take advantage of that. This is just one of many indignities. Read other comments for a full description of the special treatment that awaits anyone foolish enough to fly Rouge. Since Air Canada has - in its infinite wisdom - made these rouge flights the only way to get to Las Vegas from Montreal, my wife and I now fly United YUL/HOU -> HOU/LAS. First class is lovely and well worth the extra hour or two we spend in HOU. STAY AWAY!!!!!!! These Rouge seats are terrible. I am elite and agree with others who comment that they have cancelled flights and we have heard other passengers who fly out of their way to avoid Rouge. Row one is terrible, with a steel wall in front of you and no leg room. Also the crew use the first overhead bin for equipment, so not storage space. Very junior crew who are not well trained to serve the unhappy customers on these terrible flights. Avoid Rouge at any cost!! Air Canada's Rouge service is the worst service in the entire airline industry. It might be tolerable if you are flying from Toronto to Windsor, but Toronto to Phoenix? EVERYONE, including the Flight Attendants, were complaining about this service. I don't believe it's safe to fly so many people cramped into such small seats for such a long time. Ever heard of DVT Air Canada???? The divider is a curtain, and because J seats are just Y seats with the middle seat empty, floor storage and leaning into your space isn't an issue like it is on mainline. Also, if you're in the middle seats, there isn't anyone infront of you to lean back and take any of your space! Air Canada should be ashamed of their Rouge brand! What an absolute joke. Paid for "Premium Rouge" and got an economy seat only they don't sell the middle seat. Everything else is the same as you get in the back. Row 1 is the worst because the arm rests don't move as the tray table is in the arm rest. So, an already cramped seat is even more cramped. Take my advice (I'm Air Canada Elite) and avoid Rouge if you can. 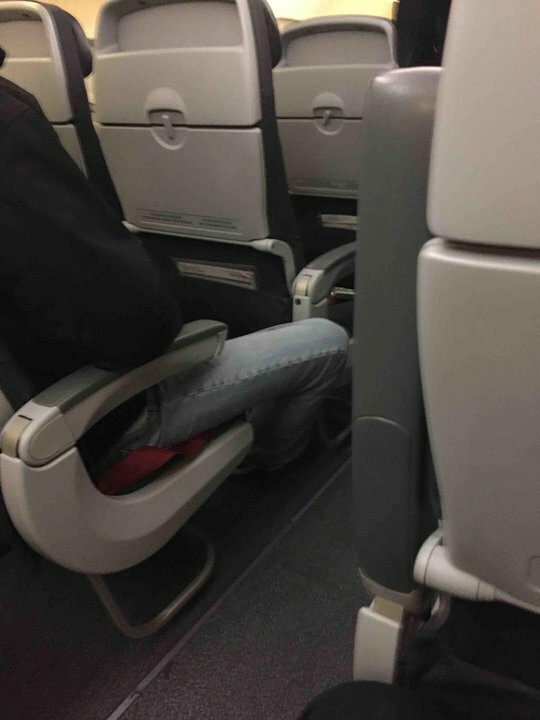 If you happen to get stuck on a Rouge flight, don't sit behind row 4 as you will get virtually no legroom. I don't have any Apple products so I used the complimentary iPad I was given to access the in-flight entertainment. However, the system was up and down and they only had a few 80's movies to choose from. I couldn't wait to get off of this plane! We were told we bought first class seats as an upgrade which we requested due to my husband being ill and recovering from an operation and needing comfort. We paide $2600.00 more for basically having an empty seat between us. The ipad and food was not used by us and even so was not worth 2600.00 If we had been told that we were not getting first class but only an empty seat between us we would have bought another seat for 1/4 at least, of the cost. Air Canada will not do anything to rectify the misinformation and sale of a product they sold and did not deliver. Rouge is terrible. Seat 1F is so narrow you can hardly move! Do NOT pay Rouge Premium; total rip-off. Seat pitch is drastically reduced from last years flight of the same number. People with long legs will find that now there is insufficient room for them.